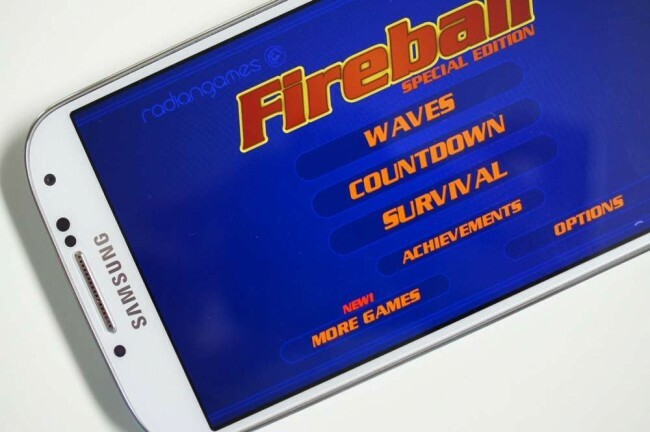 So I picked up a game this afternoon called Fireball SE because it was creeping up the charts in the “New Paid” category on Google Play and can’t seem to put it down. You play as a fireball, of course, that floats around in a space-type atmosphere trying to avoid enemies. With your thumb on the screen, you steer the ball throughout a designated area as swarms of bubbly bad guys attempt to end your flaming life. But to defeat them, you have bombs which can be set off as combos to earn you extra points or to eliminate bad guys in waves. As you eliminate waves of bad guys, you move up in levels where the difficulty also increases. There are power-ups, three different game types, achievements, and instant satisfaction. I think I’m loving Fireball SE because you can pick it up, play it, put it down for a while, and then pick it up again and not feel like you have to start over or have to invest a ton of time into it. It’s all about instant satisfaction and enjoyment here. The graphics are solid but simple, and the controls work flawlessly without much practice. The game runs $1.99, but is easily worth the price.